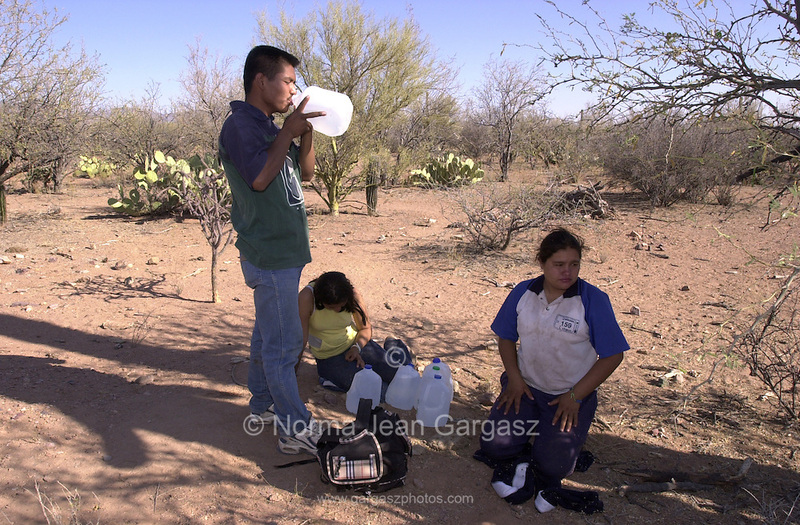 Luis Benitez Ortiz, 19, (left), Sara Ochoa Anarade, 19, and Anai Melchor Ramirez, 20, drink water along a trail south of Sells, Arizona, after crossing illegally in to Arizona, USA, from Mexico. The three, from Michoacon, Mexico, entered the United States illegally at the Arizona border on to the Tohono O'odham Nation at the deadliest stretch of desert for crossers along the U.S. border with Mexico. The water was placed along the trail about 18 miles north of the border by Rev. Mike Wilson to help alleviate deaths from dehydration.